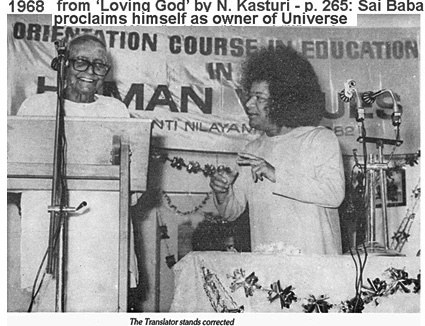 Creator of the Universe, Sathya Sai Baba? Quoted in ‘The Week’ 27th November, 20065. The official Sathya Sai censors have removed a number of the most famous and oft-repeated propaganda claims of Sathya Sai Baba from the Internet… the sort bound to attract prompt dismissal in the minds of many inquirers. The propaganda target is the wider public, which do not take well to absurdly grandiose boasts. An extremely wide cross-section of any public, except those of his own fold, would regard his claims as a proof of megalomania. Despite the attempt to create a facade of secular activities (education, health services, water projects etc.) professionally skilled people have been leaving the Sathya Sai organization since the major scandals broke from 1999 onwards, accelerated by his unexpectedly premature death from multiple organ failures (i.e. a decade or so earlier than his four differing predictions of his life span – all totally wrong). Due to the desertion of so many followers who donated money, the Sai Trust is having problems paying its considerable bills, as shown not least by its begging petition to try to get taxpayers once again to foot all their energy costs (as was the case for decades before SB’s death). Sai Baba’s leaders around the world were long since directed to avoid mention of the excessive claims when dealing with the public, but just those tall claims were and still are an absolute article of faith for members of his organization and devotees generally. This entry was posted on March 14, 2012 at 7:00 pm	and is filed under Sathya Sai Baba. You can follow any responses to this entry through the RSS 2.0 feed. You can leave a response, or trackback from your own site. Right you are, Robert! Over the course of many a decade Sai Baba invariably claimed to be the ultimate creator and master of the universe. For a long time all this pompous, inflated talk was enhanced by visual means (SB holding the sun, moon or universe in his palm or being at the centre of the entire cosmos). This was, of course, done for obvious propagandist purposes. Petty self-glorification and an unshakeable conviction as to his own infallible grandiosity were key characteristics of Sai Baba, if you ask me, self-absorbed his middle name. Devotees who thought of him as ‘the second coming’, like the Dutch lady in the clip you show here, were often berated by even stauncher and orthodox believers, because Sai Baba was not just Christ returned, in and of itself already about the tallest claim possible in Christendom, no, he was GOD the FATHER, no less, the One who sent his only begotten Son (See https://robertpriddy.wordpress.com/2007/08/03/second-coming/ Christ did not declare that he will come again. He said, ‘He who made me will come again.’). The piece about him deriding prof. Kasturi is telling also. ‘Why so much fuss about me visiting Africa?’ the master asks. ‘I am everywhere.’ Well, the point is that visiting Uganda at that time wás a big deal, fraternizing with one of the cruelest dictators alive on the planet during that era. It gained weight later on because it turned out to be his only visit to another country outside India… Contrary to his no less tall predictions that he would travel across the globe through the air one day, counter to many promises made in public and in interviews that he would go the the United States etc, he in fact never did. If anything, his claims got more and more preposterous as time progressed: just think of his idiotic, demented claim his own bodily magnetism was soo enormous that it made him wobble!! “So when I put My foot down, the whole foot stuck to the ground. It is a little hard to lift a foot that is stuck. Wherever I walk, it sticks there. Whatever is held, it sticks to My hand. This magnet is not in everyone like this. This magnet is so powerful only in Divinity.” (2003). His need to be special, the most special of all, and of all times, was pathological to the extreme. It is a well-known fact that short people try to compensate for their lack of height but his was tall talk beyond compare. In order to fulfill his childlike need to be the everlasting centre of all attention, he annexed the identity of a well respected saint from the past, Sai Baba of Shirdi (an interesting case of post mortem identity theft), declared himself to be the greatest of the great, and projected his ceaseless urge to be immortal and ever-present into the future by prophesying that he will return in a jiffy as Prema Sai, ‘to finish the job’ of fixing the world. Amen to that. Eh no: God forbid!